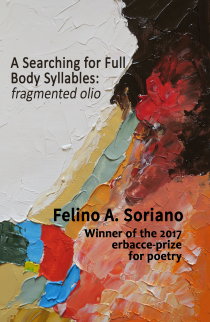 To honor the memory of our late friend and genius poet, Felino Soriano, we will be doing a special Felino Soriano Tribute Issue in the new year. If you knew Felino personally or through his poetry – i.e., you admired his verse, you edited a journal that published his verse, you collaborated with him poetically – then please submit art, poetry, fiction, non-fiction, etc. etc. etc. for our special tribute issue. You can submit a poem or two that appeared in your journal, or a poem or story inspired by his verse, or artwork inspired by his verse, or poetic or fiction or non-fiction tributes to him. I would also prefer you to write a preface to your submission detailing in what capacity you knew Felino, and in what ways his verse, his intellect, and his kindness inspired you. Submissions due March 15th to Fleurdumal666@gmail.com. February 5, 2019 | Filed under Uncategorized.